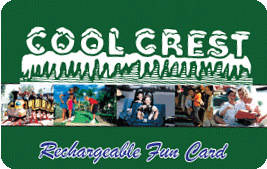 Cool Crest Gift Certificates are available now! These are good for food and attractions at our park year-round. Cool Crest Gift Certificates make the perfect gift – especially during the Holiday Season, Graduations, Birthdays, or just because! Buy online now or contact us for more information. As our gift to you, shipping is FREE! Please allow 5-7 business days for delivery.